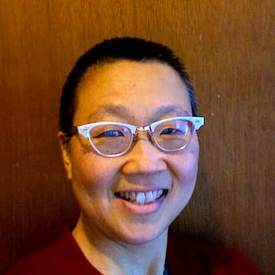 This is an interview with Peggy Hong, who is part of a growing movement to incorporate themes of social justice into yoga classes, workshops, and programs. Peggy has taught yoga since 2001. She became a certified Iyengar Yoga instructor in 2005, and currently holds an Intermediate Junior II certificate from the Iyengar Yoga National Association. She teaches “Community Gift” pay-what-you-can classes at Iyengar Yoga Detroit and New Work Field Street Collective in Detroit, Michigan. I began the way most yoga teachers in the US start off—at a studio in a white, middle class neighborhood. As I steeped myself in an examination of privilege—racial, gender, class, economic, education—I became increasingly restless and frustrated that people who looked like me, sisters and brothers of color, were few and far between, and that so many folks could not afford to pay full fare for yoga classes and trainings. A small group of us opened Riverwest Yogashala in my then-hometown of Milwaukee, Wisconsin in 2003 (incidentally, Milwaukee is rated the most racially segregated city in the USA for years running). Riverwest is one of the only racially mixed neighborhoods in Milwaukee, with students, artists, and working class folks. Our vision from the start was to make yoga affordable to all, so we offered low-cost classes, a monthly free class, and scholarship and work/study opportunities. We soon expanded by running a series of $5 classes, including a class just for women of color, and expanded the monthly freebie to a weekly “Community Gift,” which we all took turns teaching. I moved to Detroit in 2013; after decades of marriage I was ready to more fully integrate my walk with my talk, which for me meant leaving the life of a wife and householder, and embracing the path of a “yoga nun.” I began offering yoga as a sacred practice, similar to the way places of worship and meditation rely on donations instead of required fees. Detroit, with its low cost of living, a whole slew of cultural creatives, and history of radical organizing, seemed like a perfect place to launch this new way of teaching. Currently, I teach seven classes each week, a monthly 3-hour workshop, and an apprenticeship program, all on a Community Gift basis. I am consciously dismantling the notion that cost equals value, which capitalism is based on. Under the old fee-based model, I had 150 students/week, and had a reputation as a tough but compassionate, knowledgeable teacher who wove poetry and philosophy into classes. In my new hometown of Detroit, where I have been teaching a little under a year, I have about 30 students/week. Whether a student pays me $1 or $100, I give each student my all—toughness, compassion, knowledge, and poetry. I spend significant time with each of my apprentices and pour into them all I have received from my own mentors. My motto is “Give until you’re empty; receive until you overflow.” We can’t put a price tag on the things we value most. Yoga teachings are indeed priceless. I dedicate myself to Iyengar Yoga because it suits every body type and ability level, through its attention to precision, individualized instruction and adjustments, and use of props. However because the training is so extensive (requiring several years of study to become certified), the studios also tend to charge top dollar and attract highly educated students with financial means. I’m carving out a wider stream to make it accessible to a broader population. At the same time, I have drastically reduced my living expenses. I share a house with seven others at New Work Field Street Collective. I’ve downsized from a whole house to basically one room. I forage, bicycle, welcome hand-me-downs, and try to make everything I need. Frankly it feels more truthful, ecologically harmonious, and abundant than my old life. If I want to keep teaching Community Gift Yoga, this is how I need to live. I teach Community Gift Yoga not to “help” someone, but to co-create the world I want to live in: just, sustainable, cooperative, healing. As we heal ourselves, we become a healing presence in our communities. If Milwaukee is the #1 most racially segregated city in the USA, Detroit is #2. Many folks in my city have been exploited, traumatized, and abused, suffering generations of poverty, unemployment, hopelessness, and worst of all, a perception of purposelessness. What advice would you give to anyone who is going to teach Community Gift Yoga? We must come to each other in our vulnerability, in both our brokenness and our wholeness. Don’t come to help. Let the wholeness you strive to embody speak to the wholeness in your student. Do not hide your brokenness. Be in the struggle together. Realize you are here to heal each other, let your teachings flow through you, and be receptive to new lessons. This is interpersonal/social justice, whether we are stewarding the earth, community organizing, or offering yoga to our neighbors as a healing practice. Stay connected with Give Back Yoga Foundation as we share the gift of yoga with the world, one person at a time, by following us on Facebook, Twitter and Google+and by subscribing to our newsletter. Are you a yoga instructor giving back to underserved populations? E-mail Executive Director Rob Schware if you’re interested in being interviewed for this series. Thanks for all that you do in the name of service!